It's Motivational Monday again and a day where we're all going to spread some sort of positivity! I found this quote the other day on Pinterest and it made me think about bloggers and the community we're all in. I'm sure you all know there is always drama on Twitter, whether it's about a certain topic or even a specific person; you'll always find it. 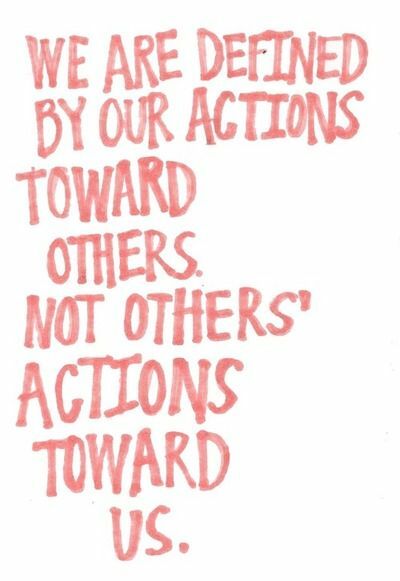 This quote made me think about all of the drama I have seen going around Twitter and although someone may have done something negative, or something we don't agree with; their actions do not define us. But instead, our actions towards other people defines who we are and I feel this is something many people forget. Just because someone has spoken negatively to another person, does this mean it's okay for you to then react to this is in a negative way? No it's not okay. Does this negative action define who you are? Yes it does. If you're rude to people and you're the one person who leaves a nasty comment on peoples' blog's, then people are going to define you as this horrible person which you might not actually be. But sometimes we forget that our actions do define us and even if we're no nasty or a negative person, one simply mistake can define us for a long period of time and this is something I really want to put out there. It's not people's actions towards you which define who you are, it's your actions towards other people which do. Take a moment to think about this. Have you ever bitten someones head off because they were rude to you? And at this moment at time did you think about the way in which you reacted? Do you now wish you reacted in a different way? Most probably. Remember this feeling, and remember how you should approach a situation. Find the positive in a situation instead of the negative. The other day I was speaking to someone when I was feeling down and they mentioned how what I was doing was incredible and to continue. This made me think about how everything I do, makes me who I am at the end and how I shouldn't regret anything which I have to say, I don't regret anything in my life. Around five years ago I was in such a horrendous relationship and I'm pretty sure everyone probably thought I regretted being in that relationship because of everything I went through and everything I put up with. However, if it weren't for the terrible relationship, where would I be now? Would I be in the most incredible relationship I'm in now? Maybe, maybe not. Would I have passed my GCSE's even when I couldn't focus? Well, I probably would have done better but who knows. Something I always tend to do is remind myself that the past is the past for a reason. It teaches us lesson's and it shows us everything we shouldn't do again, or even the thing's which we should continue to do. This leads me on to the quote above. I'm sure many of you have had someone in your life who has told you cannot do something or you're not worth anything and at that time, it probably did bring you down and make you feel completely worthless. So here's a reminder, you can be anything you want to be. And you can do anything you want to do, you just need to believe that you can. If someone tells you that you can't do something, go and do it and show them that they're wrong. 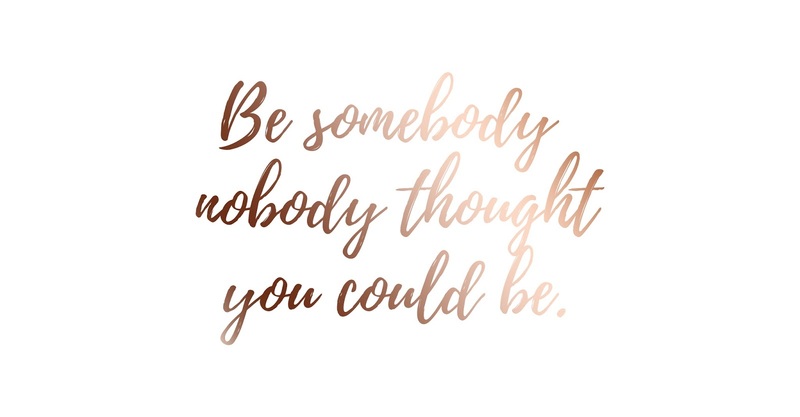 And if someone else tells you that you can't be somebody, go for it at full pace, and be that someone. Be the person you want to be and ignore everything else. If you don't, you'll regret it and this will make you the person you don't want to be. Lastly, do what you have to do until you can do what you want to do. For me, I'm currently having to go to university, until I can do what I want to do. But that's life and everyone has to do it. It's this thing called stepping stones and eventually after walking across all of the tiny stepping stones, we reach the most beautiful diamond in the world and we feel incredible. It may feel like what you're currently doing will never end, but believe me; it will. And one day you'll be doing everything you want to do and you will feel absolutely fabulous. Have a lovely Monday and a lovely week and let me know what you're getting up to today!